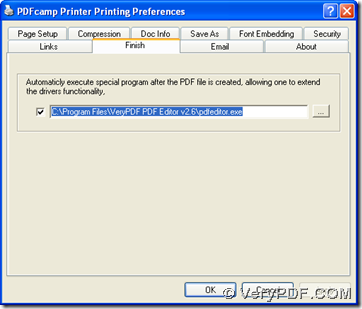 PDFcamp Printer is main converting tool in this article, so it is essential to download installer of PDFcamp Printer from this link: http://www.verypdf.com/pdfcamp/pdfcamp_setup.exe. Then please double click this installer on your computer so that PDFcamp Printer can be installed on your computer successfully. 2. 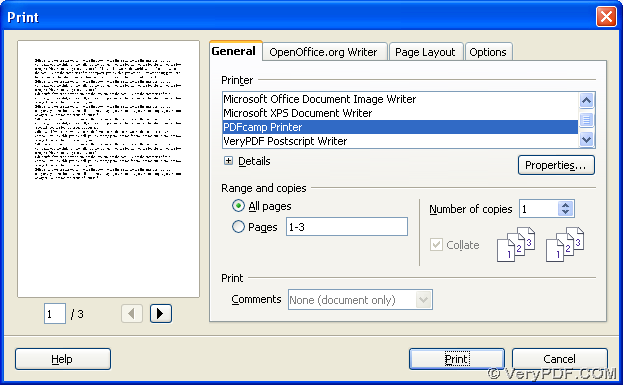 Open control panel on your computer, then select “Printers and Faxes” by double clicking it > click “PDFcamp Printer” with right button of mouse > select “Printing Preferences” on dropdown list, then printing preferences panel is opened like below, where you need to switch to the panel like below via “Finish” tab, and click check box there so that you can type the path of installer of PDF editing tool in edit box for the purpose of opening your pdf file after conversion of odt to pdf automatically. At last, if you want to save these settings, please click “OK” on panel of printing preferences. 3. 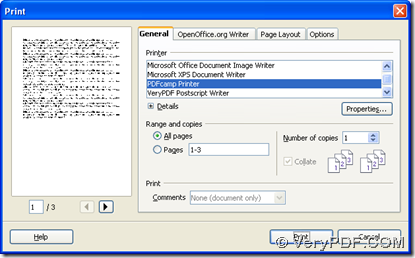 Open your odt file > click hotkey of “Ctrl + P”, then print panel can be opened like the first picture below. 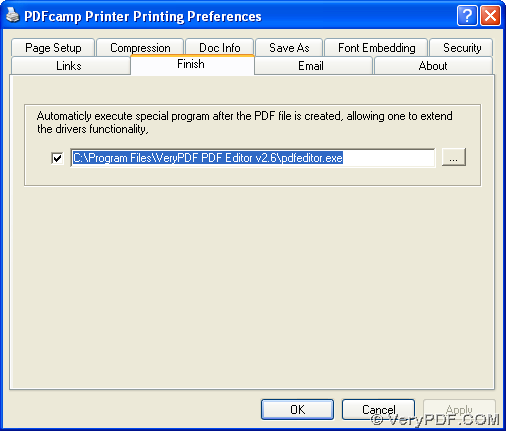 Then, please click ‘PDFcamp Printer’ there in order to use it in your process, at last, to save your pdf file and start conversion, please click “Print” button on print panel so that you can select a folder for saving pdf file in dialog box of “Save As” and your pdf file can be opened in pdf editor automatically, which you can edit there flexibly in content or comment etc..
Then, you can continue to edit your pdf file in your editor of pdf file on your computer. 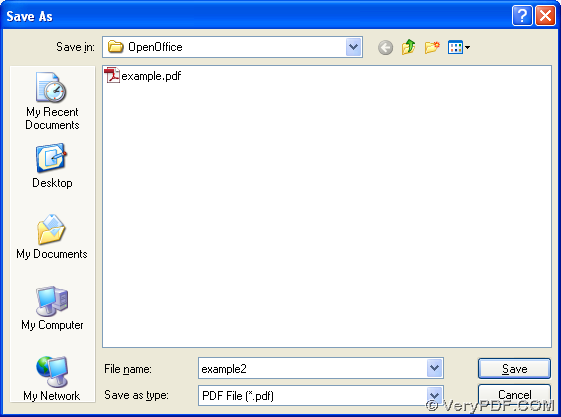 However, here if you do not own proper software to help you edit your pdf file, maybe you can try PDF Editor, which is a simple-to-use software, and you can download it from this link: http://www.verypdf.com/pdf-editor/pdfeditor_setup.exe, then follow setup wizard to install PDF Editor on your computer successfully. By now, if you want to know more about PDFcamp Printer, please click this link to visit its homepage: http://www.verypdf.com/pdfcamp/pdfcamp.htm. If you have questions on this process from odt to pdf, please leave your opinions here. Thank you for reading this article. 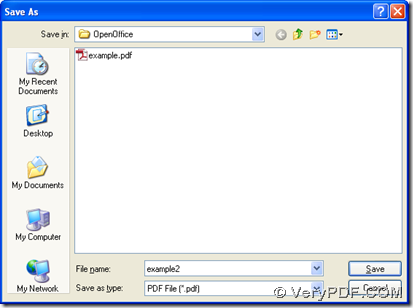 How to print HTML file to PDF document? This entry was posted in PDFcamp Printer and tagged ODT to PDF. Bookmark the permalink.